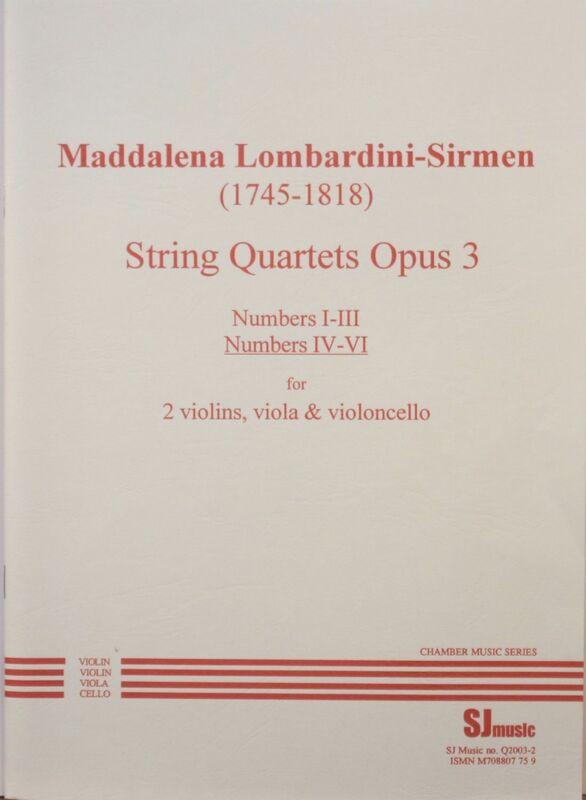 These three string quartets are part of six published in two volumes by SJ Music. They are tuneful and straightforward to play. Maddelena Lombardini-Sirmen, a violinist, singer and composer, was born in Venice in 1745 and was, at one time, a pupil of Tartini. Aged 22 she married Ludovico Sirmen and they toured Europe together. However, they separated, and she tried, unsuccessfully, to establish herself as singer in London. She was then not able to repeat her earlier success as a violinist, and returned to Italy, where she died in 1818. She wrote a lot of chamber music, which was widely known in her lifetime. Leopold Mozart mentioned hearing “a beautifully written concerto” by her in a letter to his wife and son Wolfgang in 1778.